Dr. Michael Hicks in the classroom at Centenary. SHREVEPORT, LA — Dr. Michael Hicks, assistant professor of education at Centenary, has been accepted as a member of the Diversity Scholars Network (DSN) at the National Center for Institutional Diversity (NCID) at the University of Michigan. The DSN is an interdisciplinary community of scholars who are committed to advancing understandings of historical and contemporary social issues related to identity, difference, culture, representation, power, oppression, and inequality. Founded in 2008, the DSN is a growing community that includes over 1,000 scholars from more than 220 institutions across the world. As a member of the network, Hicks will be able to make connections with other scholars and will also have the opportunity to apply for scholarships, grants, workshops, and scholar-in-residence programs to further his research and teaching activities. For the past ten years, Hicks has provided educational training and professional development to teachers and administrators across the state and the region. In 2008, he convened the first of a series of professional conferences aimed at dismantling the school-to-prison pipeline that was reaching disheartening levels for black boys in Caddo Parish. His current work with teachers is focused on helping K12 faculty identify their own biases and deficit perspectives that may be limiting student performance and negatively shaping classroom and school culture. Centenary’s recently revamped undergraduate education program offers a unique bachelor of arts in elementary education with a concentration in community and social justice, helping students gain the knowledge and skills to be responsive to regional socio-economic and cultural issues. The department’s graduate program has also identified “community” as an area of focus. 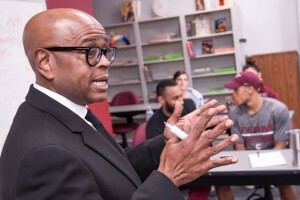 Hicks joined the faculty in Centenary’s Department of Education in August 2018 after serving as director of community partnerships and adjunct professor of education at Southern University in Shreveport. He earned a bachelor of arts degree in sociology from Morehouse College and a master of arts in guidance and counseling from Louisiana Tech University. He completed his Ed.D. in education leadership at Louisiana Tech, focusing his research on instructional leadership practices of Louisiana elementary and middle school principals.